After an overnight coach from Airlie Beach to Cairns, we pulled into the central bus terminal where we were greeted at 6am by dozens of homeless drunk locals…we grabbed our bags and made a quick escape. 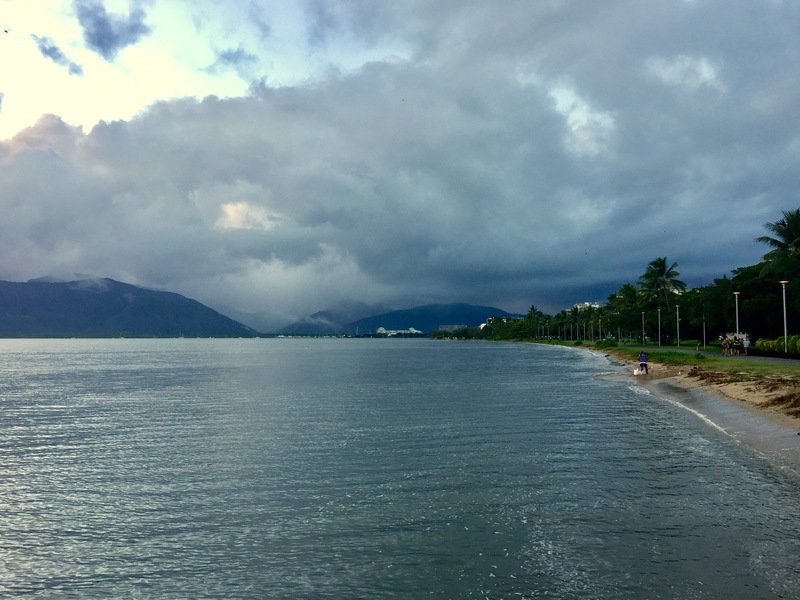 Our first impressions of Cairns were not overwhelmingly positive – very little there, not especially picturesque and the weather was turbulent. This may well have all been influenced by the lack of proper sleep for several days and the fact that our early arrival meant we couldn’t checkin. We decided to kill time by going to the cinema (for the first time in three months) to see Logan. A decent film which bought enough time until we could get into our room and sleep…16hrs worth of sleep! The downside of our north Cairns motel was a 3km morning walk to the boat terminal – ready for our 7am departure. Upon arrival the crowds had already started to assemble and it was clear that this wasn’t the type of small dive groups we were used to, but rather diving on an industrial scale. 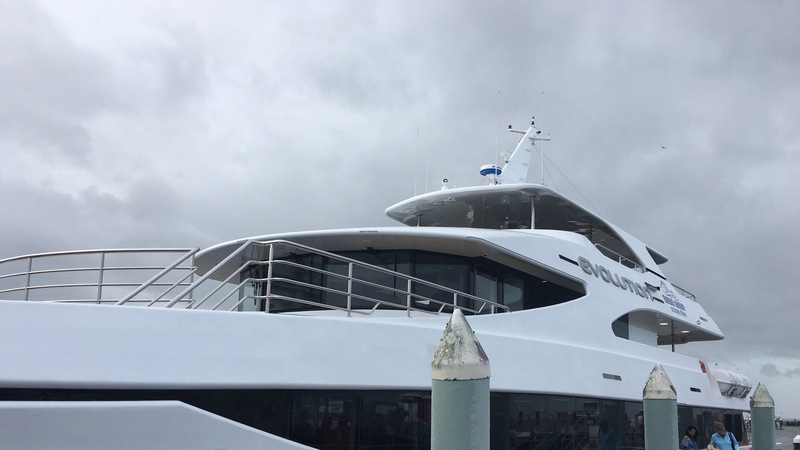 After checkin we were directed to the Evolution, a huge ocean going catamaran which could accommodate hundreds of tourists. We were whisked upstairs to the ‘Certified’ section where we were joined by only five other divers – a few dozen, including Sam then sat around us for the ‘Intro’ dive, while the remaining masses, of mainly Chinese tourists seemed to all be day pleasure cruisers who’d come on board for either the helicopter ride or glass bottom boat. 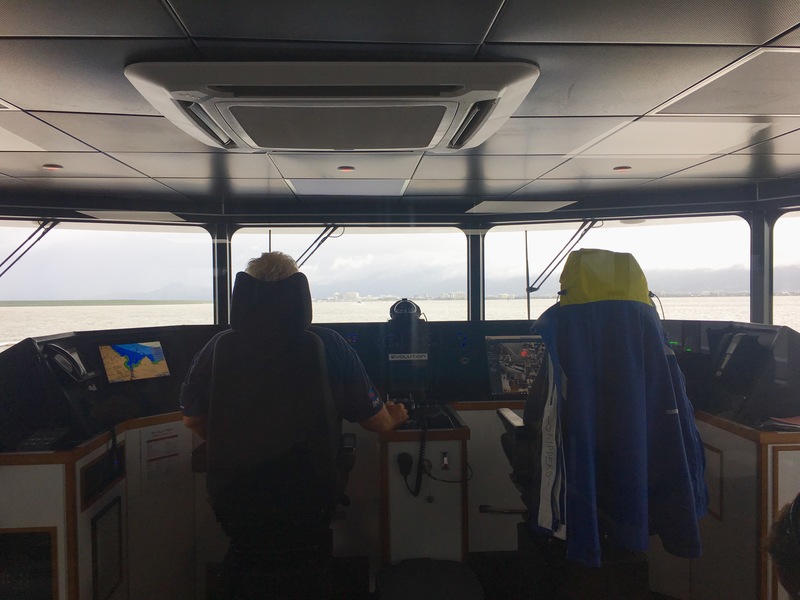 As we pulled out of port it soon became apparent that those visitors not used to the ocean would be in for a rough ride – we opted straight away for the sea sick tablets by within minutes of Cairns harbour the swells had grown and the captain had cranked the engine up to 28 knots. As the ship tossed and bucked on the large swells so the aft decks filled with tourists ‘watching the horizon’ and taking in fresh air. On the lower deck it was a different matter – fifty or so people were sat aft, many crying, all vomiting as crew frantically tried to wash puddles of sick off the deck and catch stray children that were close to being flung overboard. The whole scene looked like something from a disaster film and we were thankful for our sea legs. 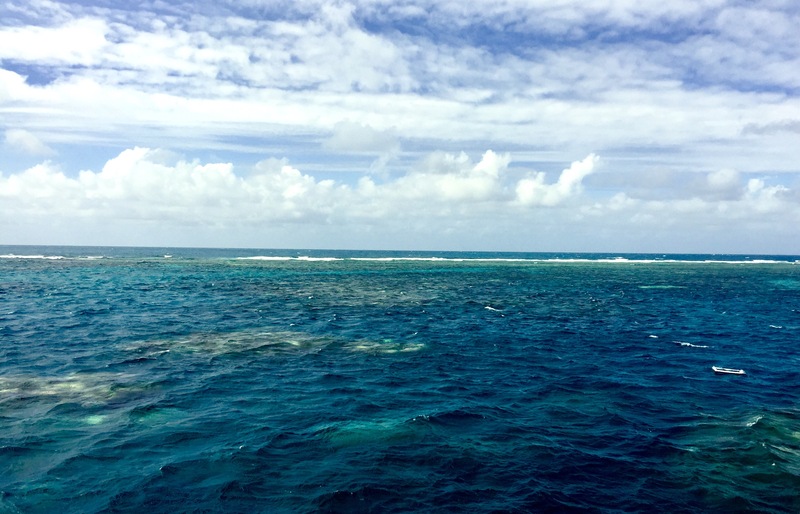 After forty minutes of rocking around the water calmed as passed over the outer Barrier Reef on Norman Reef and the ‘certifieds’ were summoned to kit up. 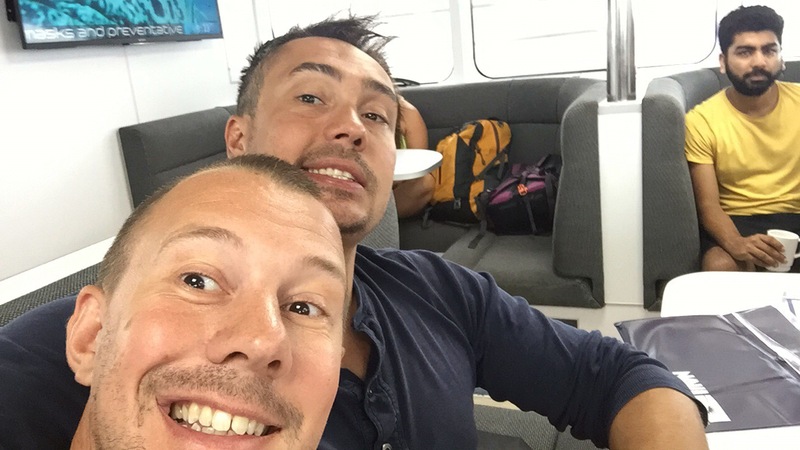 The commercial aspects of the dive were clear to see, everything you’d expect to be included in a standard dive package was an extra charge including ‘stinger suits’ and the dive master – this being the first time in 7 years of diving that there’d even been an option to dive without a DM! The basic cost of the dives however was reasonable at A$20 and we signed up to do all three on offer. The first dive served as a useful refresher, even after 50 or so dives there’s still that first few moments when your brain struggles to rationalise that you’re breathing underwater. It was also memorable by the fact that a Japanese lady with open water qualification clearly couldn’t swim (or dive for that matter) and had to be kept upright and afloat by the DM the whole dive). The Reef itself is pretty but largely unspectacular – nice corals and reasonable fish life but we realised how spoilt we’d been diving places like Truk Lagoon and Mozambique. We resurfaced through dozens of snorkellers and Intro divers all flapping around in the water and sharp elbows were needed to get back on board and change kit. The numbers thinned for the second dive, with just us and a young Dutch guy named Lars. With just us and the DM we got longer dive time and depth and found a friendly turtle who spent time eating on the Reef unfazed by us watching. After completing the dive and logging back in the boat pulled out at pace to the second dive spot at Saxon Reef – again the diving was okay but unspectacular – the damage on the Reef was devastating to see but with big boats like the Evolution pulling in every day there is untold damage being caused. Back on board and it was time for lunch and free drinks – Mike and Lars engaging in an indepth discussion about the similarities between Dutch and Afrikaans and discussing politics and travel while the rest of the boat returned to being sea sick and being soaked by the huge waves crashing over the bow and decks.